MS Access to MySQL Database Conversion Tool is read only and non destructive program to convert entire or selected rows or columns of Microsoft Access database into MySQL database in just a minute. Fast database converter utility is password protected and first requires windows or SQL server authentication for secure database conversion. Simple to access MS Access database converter facilitates to convert MS Access files even password protected files as per your choice. User friendly database converter software supports all major database datatypes, attributes and Unicode architecture for better database conversion results. Easy to use database converter tool does not require any special skill to operate it. Easily convert entire or selected database records as per your choice. 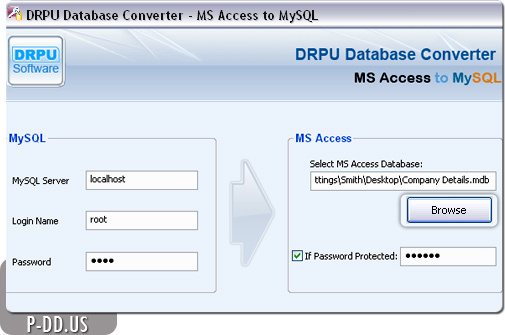 Convert MS Access to MySQL Database records even with password protected files. Support all major MS access database data type and attributes while conversion process. Facilitate to overwrite converted database with existing database or saves converted database at user specified location. Support Unicode architecture set and maintains full database integrity. Support all major version of MS Access and MySQL database server. Provide systematic help menu for user’s assist. Easy to use database converter software provided with user friendly graphical user interface.